Shrub in the Verbenaceae family, native to South America, evergreen in tropical areas, but deciduous everywhere else. Lance-shaped, mid green leaves with a somewhat rough upper surface, about 8 cm long, arranged in whorls of three. Foliage emits a strong lemon scent. Panicles with tiny white or lilac flowers in summer. Synonyms: Aloysia citriodora, Aloysia triphylla, Lippia citr(i)odora, Lippia triphylla, Verbena triphylla. Prefers a sheltered, sunny position in free-draining soil. Is also happy in a partially shaded spot, especially in areas with hot summers. The plant tends to send out long shoots, in particular when not receiving all day sun, but it responds well to regular trimming. In the dormant season it can be pruned hard if required. Fertilise regularly during the growing season. Quite drought-tolerant once established. Caterpillars, spider mites and whiteflies like to feed on the foliage.Tolerates light to moderate frosts (zone 8). In colder climates, grow Aloysia citrodora in a pot, and overwinter indoors. It will most likely loose all leaves after the move, but this is normal. When grown outside, the leaves will drop in response to cold temperatures or stress. Avoid overwatering, in particular when the plant is dormant. Not just a pretty plant, but very useful too. Leaves are used to make herbal teas. They can also be added to jams, puddings, fish and chicken dishes, salads, teas and other drinks to impart a lemon flavour. Essential oil extracted from the foliage is used in perfumery. Dried leaves add a lovely fresh scent to potpourries. Plant Aloysia citrodora where you can appreciate the gorgeous fragrance. You can train it to a single leader, much like a topiary subject. 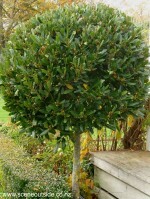 Fast growing, evergreen shrub with glossy green leaves and cascading branches. Purple-blue flowers with wrinkly white edges, mainly during summer, followed by orange-yellow berries. Poisonous leaves and berries. Attracts birds and butterflies. Duranta repens is a synonym for Duranta erecta. The species itself is native to Southern USA, Central America, the Carribean, and South America, and has become an environmental weed in several warmer parts of the world. The newer cultivars, such as 'Geisha Girl' are thought to be less invasive. Prefers a sunny position in any well-draining soil. Water regularly until established. Fertilise in spring with an all-purpose fertiliser. Prune after flowering to keep the plant compact. Tolerates light frost (zones 9-12). Can be trained as a standard, grown as a shrub, or trimmed as a hedge. What a pity this shrub is so toxic! When flowering, it looks absolutely stunning. Evergreen variegated shrub, native to Japan. Main branches spiny and more or less horizontal and arching. Copper coloured twigs. Oval leaves shiny green and yellow above, dull grey beneath with small brown glandular dots. Insignificant, but very fragrant flowers in autumn. Fast growing and tough: prefers full sun, but tolerates a wide range of conditions. Evergreen shrub with glossy, dark green, finely toothed foliage and pale pink with white, 1 cm wide flowers for 1-2 months from early summer. Attracts bees. Escallonia 'Apple Blossom' prefers a sunny or partially shaded position in any well-draining soil. Prune to keep compact. Suitable for coastal gardens. Responds well to trimming. Frost hardy to about -12 deg. Celsius. Drought tolerant once established. Usually disease free, but may get brown scale. Very pretty plant when in flower, but also a lovely foliage plant. Great choice for a fine-textured hedge. Not as vigorous as most other Escallonia hybrids, so requires less frequent pruning to maintain as a hedge. When intending to grow Escallonia 'Apple Blossom' as a single specimen, plant it towards the back of a border. The glossy dark green foliage is a beautiful foil for other flowering plants. Evergreen broadly conical tree or large shrub from the Mediterranean region. Glossy, leathery leaves, highly aromatic when crushed and useful in cooking. Small, star-shaped yellowish flowers in spring, followed on female plants by green egg-shaped fruits that ripen to purplish black in autumn. Prefers a sunny or part-shady position in well-drained soil. Leaves are darker green when grown in the shade. Remove any suckers that may be formed at the base of the plant. Hardy to -12oC. Laurus nobilis lends itself perfectly for clipping and shaping. It is a popular hedge and topiary plant. You can create your own topiary specimen by selecting a plant with a good, straight central leader (as opposed to a bushy plant that has its tip removed to encourage branching). Gradually remove side branches that are forming too low on the main stem, untill the plant has reached the height from which you wish the canopy to be formed. Now allow the side branches to grow, and, once or twice a year, trim the canopy to a ball-shape or any other shape that takes your fancy. Strongly aromatic evergreen shrub, woody at the base, with upright branches, grey-green leaves and lilac flowers for most of the year. Native to the Mediterranean region, the Cape Verde Islands and Madeira. Leaves are sticky, linear, 3-4 cm long, 0.5 cm wide. Easy to distinguish from other lavender species by the bluntly toothed leaf margins. Flowers are arranged in tight spikes, topped with pale purple bracts, to about 5 cm long on stems held above the foliage. Attracts bees and butterflies. 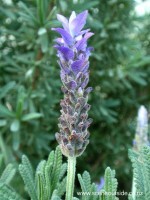 Lavandula dentata does not have the typical lavender fragrance. Its smell is more aromatic than "flowery", rather like a blend of rosemary and lavender scents. Prefers a hot and sunny position in well-drained neutral to alkaline soil, not too fertile, but adapts well to a range of situations. It is tougher and less fussy in terms of growing conditions than most other lavender species. Susceptible to root rot in poorly drained soils. Very drought-tolerant once established. Tolerates light to medium frosts (to about -7oC). Prune after flowering to keep compact and remove spent flowers. Mainly grown for its silvery grey foliage and subtle flowers. Suitable for topiary and hedging purposes. May also be grown in containers. Excellent choice for coastal gardens and for hot and dry areas. Vigorous, upright and compact, evergreen shrub with purple flowers and showy pale yellow bracts in spring. The flowers themselves are tiny, but are tightly arranged in a spike-like inflorescence to about 4 cm long, or to 6 cm long including the terminal bracts. Opposite pairs of linear, aromatic, yelow-green leaves (approximately 4 cm x 0.5 cm). May self-seed, but seedlings do not necessarily have the exactly same appearance as the parents. Flowers attract bees and butterflies. Lavandula stoechas 'Patleigh' originated in New Zealand from a cross between two unnamed Lavandula stoechas parents. Grows best in full sun and any soil type as long as it is well-draining. Tolerates wind, drought, and coastal conditions. Remove spent flowers to encourage additional flower production. Lightly prune in autumn to keep the plant compact. Tolerates moderate frosts only (zones 8-9).